The William G. Pomeroy Foundation has announced they are now accepting 2018 applications for fully funded Historic Roadside Markers to commemorate the history of the Adirondacks, including locations in Essex, Warren, Hamilton, Saratoga, Washington, Clinton and Franklin Counties. Municipalities and charitable 501(c)(3) organizations in New York State are welcome to apply for the Historic Roadside Marker Grants. Local historical organizations or municipal historians will often apply for the grant on behalf of property owners. Letters of Intent for are due by September 14; the final application deadline is October 1, 2018. A complete grant schedule by region is available on the Pomeroy Foundation website. 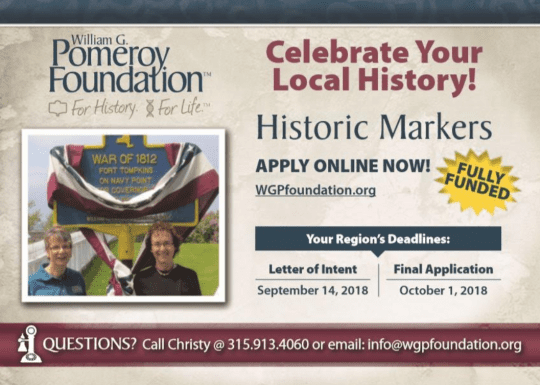 For information about all of the Pomeroy Foundation’s Historic Signage Grant Programs, marker guidelines and how to apply, visit their website or call (315) 913-4060. A version of this article first appeared on the Adirondack Almanack.